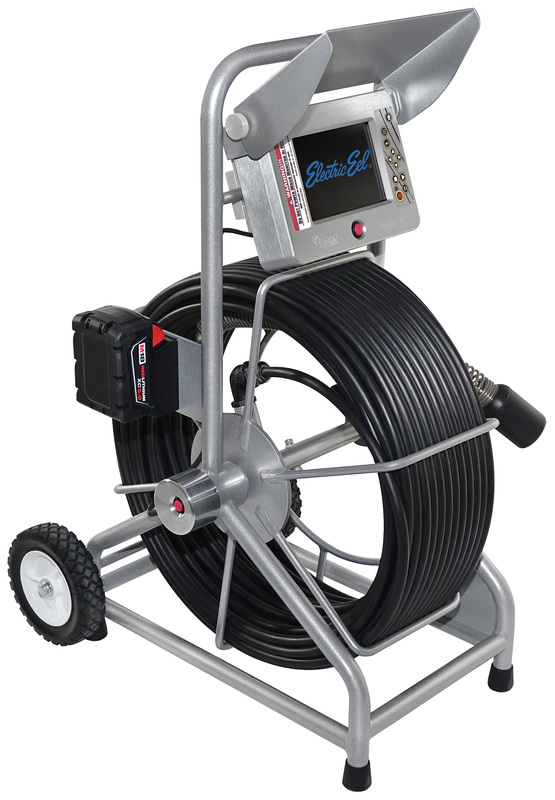 The eCAM Ace 2 (SL) Pipeline Inspection Camera System is a rugged stainless steel housed 1.68” dia. color camera for inspecting 3″ to 10” lines. Sapphire lens with 20 LED light ring and high resolution CCD element. Flexible camera spring designed to navigate 3” P-traps. Auto iris adjusts lighting automatically. Impact-resistant polycarbonate light ring cover. Industry standard 512HZ sonde. 5.4” LCD monitor with AR film for optimal viewing in sunlight encased in an anodized aluminum housing mounted to the reel. Protective acrylic, anti-glare monitor shield. Video output jack for recording option. Rugged and portable powder-coated steel frame. Standard with 200 ft. of Braided Fiberglass Premium 1/2″ diameter push rod. Secure-locking reel brake. Heavy-duty screen cover closes to protect the monitor when in transit or storage, flips up as a sun shield and can be retrofitted to existing units.